Every child is a promise and hope for humanity. of experience in his environment. Looking for a quality early childhood program for your child? Join us and see how dedicated we are to providing the best early preschool and kindergarten education. 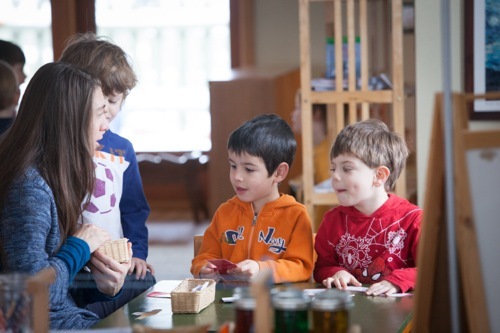 Our Montessori teachers design an effective, individual learning experience for each child aged 2.5 to 6. Our programs focus on the children, not the teacher or a rigid curriculum. Our multi-aged classrooms are specially prepared to encourage each child to actively participate in his or her learning. All our staff have Montessori certifications, which includes a full year of Montessori classes and an internship, equivalent to a master’s degree. Our highly experienced teachers are dedicated to bringing out the best in every child. Montessori offers more “advanced” lessons than what you might find in classic preschools or kindergarten. For example, children do addition, subtraction and beyond with numbers in the thousands using concrete materials. 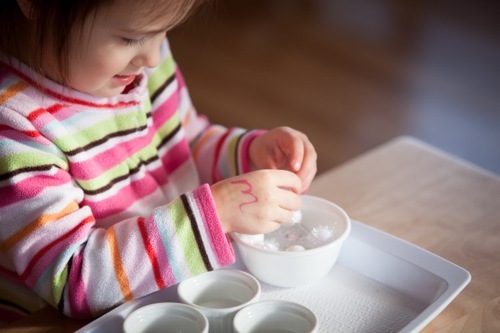 This hands-on, “sensorial” schooling is ideal for kids, because that’s how they learn. If you’re looking for a Lafayette preschool, and not just a daycare, for your 2 and 1/2 year old (or older) child, take a look at Forest Park Montessori School. It’s an amazing, nurturing environment where your child will grow and thrive. My son can’t wait to go to school each day. It’s a joy to see his academic knowledge increase week by week. The multi-age classroom is so beneficial as he is mentored by older students and then has the opportunity to model those skills with his younger classmates. His self-confidence has soared and we are thrilled to be a part of such a vibrant and nurturing community! We have both our children at Forest Park. I didn’t know a thing about Montessori education and the things my kids have learned have blown me away. They’re confident, interested in learning, and have learned great behavior. On top of that my oldest is reading chapter books at age 5! And all the kids her age at FPMS are on that track, simply blew me away. With three boys all under 5, we, like a lot of parents, were looking for the environment where they could learn, be nurtured and express themselves. The day we walked into the classroom at FPMS we found what we were looking for and through the last 18 months we’re more and more pleased with that decision. We really have something special at FPMS! Forest Park Montessori School was founded in July 2010 by a caring and dedicated group of parents, families and educators, created to be a place where children thrive in an environment of love, compassion and joy. We are dedicated to providing the best early childhood education to every child in our care. Did you know that by making a monetary donation to Forest Park Montessori School, you can take advantage of the Colorado Child Care Contribution Credit and grow your gift through tax credits?